Sitting at 25.3 million sold as of July 2015, leading in every European country, and winning most months in the United States, the PlayStation 4 has a clear sales advantage over the Xbox One, which was sitting at 10 million sold as of November 2014 and was likely around 12 – 13 million after the first quarter of 2015. In a lengthy interview at the 2015 GeekWire Summit (starts at 2:15 of the above video), Phil Spencer, Head of Xbox, discussed a number of topics surrounding the Xbox One, with the big question of whether or not they could beat Sony this generation coming at 11:45. You know, I don’t know. You know, the length of the generation… They have a huge lead and they have a good product. I love the content, the games line-up that we have. Because it’s easy to read the blogs and the sites and my Twitter feed and see what the customers think of our brand and our product, but the team in Redmond took as much of a hit as the external community did around the launch. And I sit back and I think about an [organization] of thousands of people, you’re down in the organization and some words and some actions from executives kinda just trash all the work that you’ve done over the last three years, many weekends and nights, and you start to question why am I doing this? Why am I working so hard when a few crass comments can actually position our product more directly than any work that the team was doing? 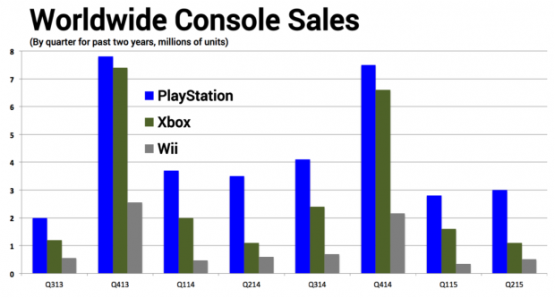 Regarding market share, the above graph was shown off, revealing that Sony has won every single quarter with the PS4. Early on, Spencer says the chart motivated him and he started making statements like, ‘We want to win,’ and turning it into a competitive thing. With the PS4 now at a lower price in the United States and Canada, do you think the Xbox One will ever catch up?